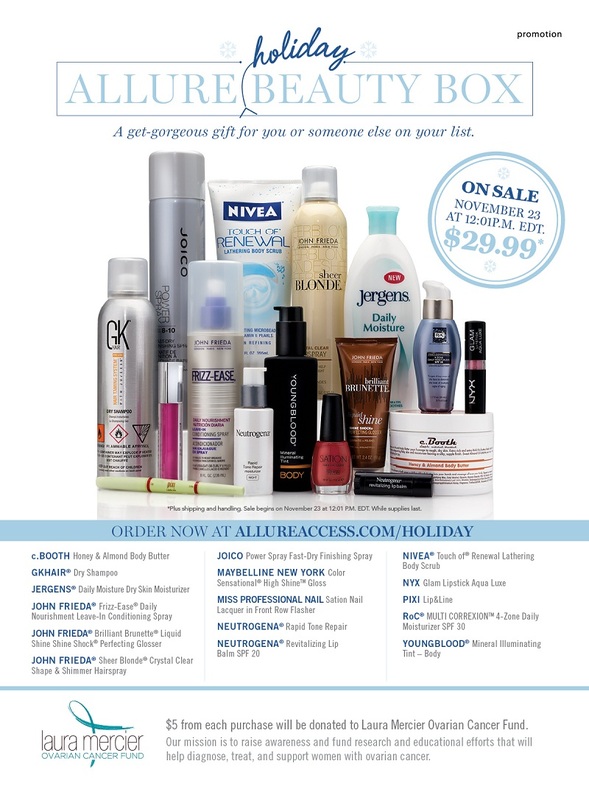 The Allure Beauty Box goes on sale on November 23rd! Are you ready??? It will go live at 12:01 p.m. ET! I know where I will be Black Friday! You can purchase it HERE on that day! 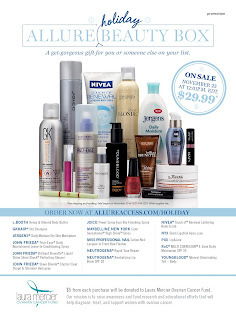 With those amazing products, I would say it is WELL worth it! GK Hair Dry Shampoo. We think it will be this, with an Amazon value of $15.00. Jergens Daily Moisture Dry Skin Moisturizer. We think it will be this, with an Amazon value of $3.99. John Freida Frizz Ease Daily Nourishment Leave in Conditioner Spray. We think it will be this, with an Amazon value of $4.79. John Freida Sheer Blonde Crystal Clear Shape and Shimmer Hairspray. We think it will be this with an Amazon value of $4.08. Joico Power Spray Fast-Dry Finishing Spray. We think it will be this with a Drugstore.com (not available on Amazon) value of $11.20. Maybelline New York Color Sensational High Shine Gloss. We think it will be a similar gloss to this, but obviously in a brighter color, with an Amazon value of $2.70. Neutrogena Rapid Tone Repair. We think it will be this (the bottom rectangle on the bottle in the picture, we think is the spf 30 mark), with an Amazon value of $15.72. Neutrogena Revitalizing Lip Balm SPF 20. We believe it will be this, with an Amazon value of $7.92. Nivea Touch of Renewal Lathering Body Scrub. We believe it will be this, with an Amazon value of $6.39. Nyx Glam Lipstick Aqua Luxe. We believe it will be this, with an Amazon value of $6.90. Pixi Lip & Line. We believe it will be this, with an Amazon value of $4.95. ROC Multi-Correxion 4 Zone Daily Moisturizer SPF 30. We believe it will be this, with an Amazon value of $17.04. Youngblood Mineral Illuminating Tint- Body. We believe it will be this, with an Amazon value of $31.38. Of course, this is all speculation, and the Amazon prices fluctuate greatly. Values are based on the Amazon prices at the time of this blog post. Total estimated value: $146.14. Clearly it is an amazing value, assuming our estimates are right! The link for the box don't work. This sounds great!